And we're off! A week into 2019, and the only resolution I made is to cook more at home. So far, success! Almost three meals a day, every day this week, and man does that mean a lot of leftovers. I'm using a cookbook that I bought my mom for Christmas, and then promptly bought for myself - Cook90 by David Tamarkin - and the recipes are so simple and I often have a lot of the ingredients at home already, which is one of my main cookbook prerequisites. Not going to ask me to by rosewater or violet petals. Though I may be able to find the violet petals in our yard in a few months. It has been very nice to get back into Bloodroot routine after the holidays. Coming back to work has been a relief, and isn't that a wonderful thing to say about your job? I'm happy to be able to say that I like getting a break from the shop, and then I really like getting back to it. Working with David and Luke doesn't hurt anything. We run a very mutually supportive workplace :) 100 yards from our houses. We talked a lot over the break, since we're all together anyway, no matter what time of year it is, about what we wanted for Bloodroot and our customers in 2019. I feel like (and I know other people feel like) the only reason businesses should really exist, is they make something about their customers' lives easier or better. Life is hard, and any business should work to make something about their customers' lives more enjoyable, more beautiful, more pleasant, simpler...the list goes on and on. At Bloodroot, we strive to make your time in the kitchen more beautiful, more enjoyable, more pleasurable. You are there in your kitchen, most likely, every day. Often with your families or often alone, feeding each other, serving each other, feeding yourself, caring for yourself - either during a great day, a sad day, a hard day. How can we make that thing you have to do every day, several times a day, something just a little more (or a lot more) enjoyable? 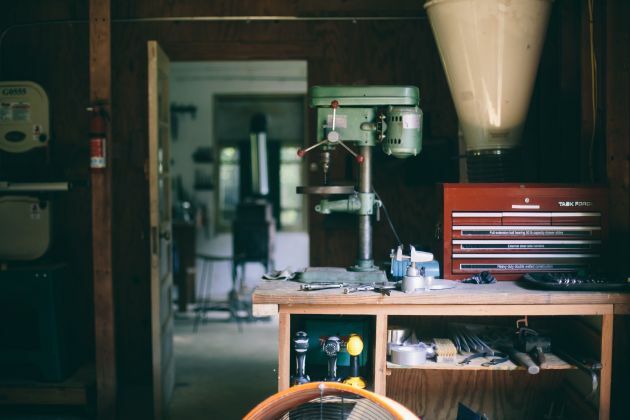 So far, we have stood very definitely behind the fact that your tools should serve you well. They should last a lifetime, be beautiful, be a joy to use, and they should be made in a way that you can feel good about, ideally by people whose names you know. Your knives should make your work, your cooking, easier - not harder. And, the process of getting those knives, should be like the process of getting something from a friend who cares for you. Even if that friend has a very long waiting list :| :) So we strive to care for each of you who emails us like we know you and want the best for you. Because in a lot of ways, over the years, we will come to know you, as we have come to know many of you already, which is one of our greatest pleasures in this work. One of the things David, Luke, and I have been discussing, however, is that the knives we put in your hands require a certain kind of care. A kind of care not often required by less expensive stainless steel knives, and a kind of care people are not always able to give without a little bit of learning. So, we hand out our Knife Care cards with every knife we deliver, and mostly, that works just great. But I know there is more we could do. That's why, in December, we collaborated with another business in town - Water's Edge Woods - to offer an end-grain walnut cutting board, because end-grain cutting boards substantially improve the edge-life knives. Using an end-grain cutting board means your knives stay sharper, longer. It helps our knives perform for you in the way that we want them to. We will have another batch of these cutting boards available in February. In 2019, we would like to, slowly, add other items that we can get to you that will help your time in the kitchen be more pleasurable. We are often asked about knife storage - how should your new Bloodroot Blade be stored? Can I put it in a drawer? (Nope). Where should I put it? So, we would like to begin offering several different types of knife storage solutions - magnetic knife racks, perhaps a knife block, a knife...kind of peg shelf that David came up with that we have in our kitchen and love...we'd like to make that kind of thing available to you. 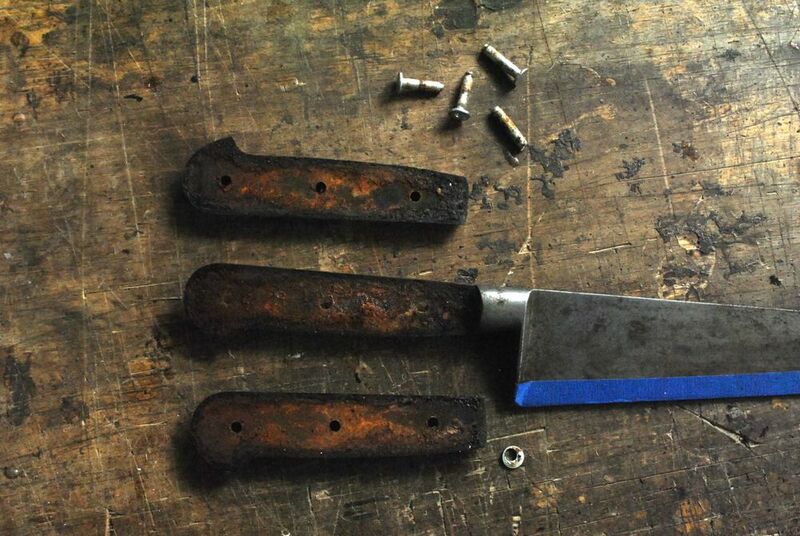 How should we keep our Bloodroot Blades sharp, you often ask. Well, perhaps it would be good if we made that easier for you, kept ceramic hones in stock that you could buy without having to scour the great Amazon, looking for the right one. All this to say, we've been talking a lot about how to take care of you. We could hire a bunch of people, get super big, make our waiting list shorter, but that would take us away from the kind of business that sustains our lives in the way we want it to. So if we're not going to do that, what can we do to make your lives in the kitchen, cooking, eating, feeding yourselves and your families, easier, more beautiful? That's what we're going to be trying to do in 2019. If you have any ideas about how we can do that (besides building a factory), please send them our way :). We are so happy to be looking forward to another year with you, in the shop every day, in the garden. Thank you again for making this business possible. We hope that you had a wonderful holiday season, and are having a lovely to start to this new year. Katy, for David, Luke, and Helen. In preparing to write this letter, I (Katy) went back to read all the letters David, Luke, I have written to you, our good friends, this year. In December, I always try to think back about the year in the shop. What did we do? And at first, it feels like a blur. Did we do anything? I mean, I know we made a lot of knives :) But, what else? Reading back through the letters we have written you, though, I see that we've done a ton! What a neat and fun year it has been. 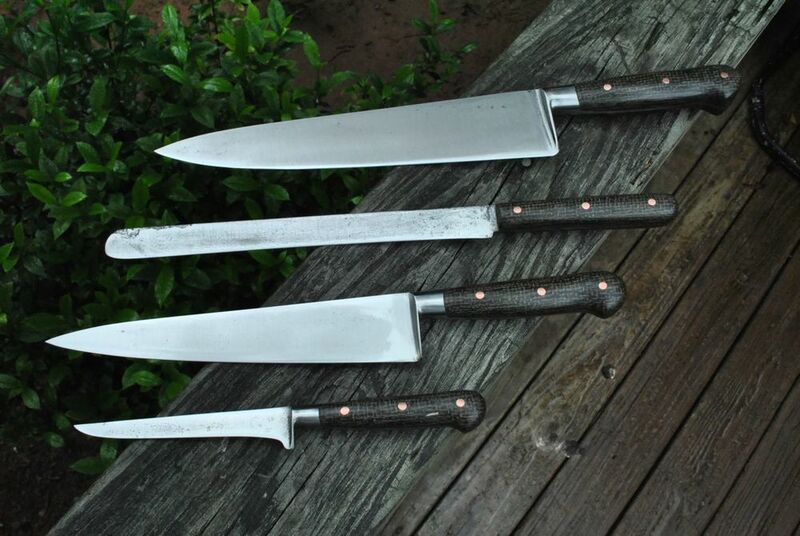 Early in the year, we sent off a batch of steak knives to Dominique Crenn's restaurant in San Francisco - Atelier Crenn. Three days ago, Atelier Crenn was awarded their third Michelin Star, a huge honor, and Dominique Crenn is the first female chef in the United States to be awarded a third star! That's definitely long overdue. So, our knives are in a three Michelin Star restaurant, and not one, but two! Because SingleThread was also awarded their Third Michelin Star. We are so proud, more than proud, to be a part of the work these amazing people are doing. A few weeks ago, David and I took our first vacation in years, and we went to California and stayed at SingleThread, and I have never seen such a place or been pampered to that level or eaten such food in my whole life. They hadn't been awarded their third star yet, and leaving, I was like, I don't even know what they'd need to do for a third star? Have people massage your feet at night until you fell asleep? (SingleThread is also an inn). But they have their third star now, and I'm not at all surprised. If you ever have the time and funds to stay and eat there, it is quite a privilege. So, congratulations, SingleThread and Atelier Crenn - we are so glad that the work you are doing is being recognized, and thanks for having our work involved with yours. In the shop, Luke and David put out their first experiments in matching their Damascus and wood grain patterns, which was very well received by you guys. Thanks for always rewarding their creativity :) And of course, they worked hard to send out so many beautiful knives in the world to you lovely people. We started using the gorgeous copper beech that was given to us early in the year, and it is just so pretty. And, we are just so thankful that y'all come back month after month, and that your support allows us to keep working in this beautiful place. In the holiday season, and really all year long, we think about the fact that when you guys come to us in the lottery sales or for custom orders, there is no item you can get from us very quickly, unless you are one of the 30-35 people whose names are selected in the lotteries. And you guys are incredibly patient with this, for which we are endlessly thankful. 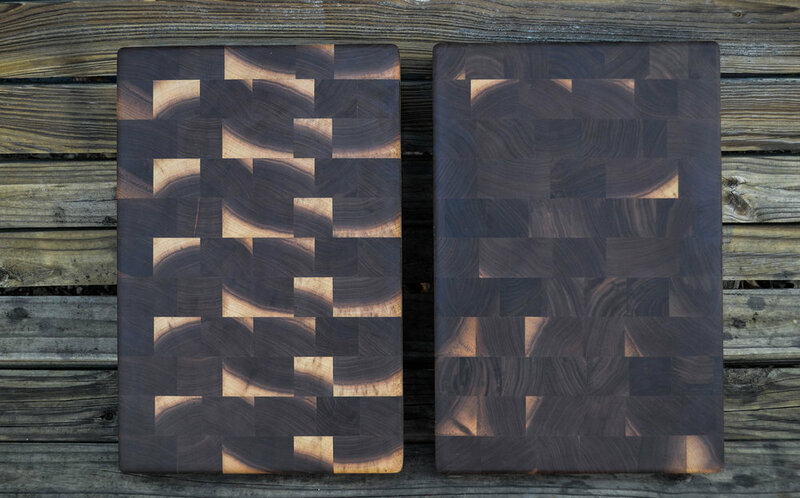 But, about six months ago, our friend Andrew Dittmier and the folks at Water's Edge Woods approached us for feedback on a cutting board design they had been working on and we started to collaborate with them. The people of Water's Edge Wood have been in our close community for many years and have supplied us with wood for knife handles, sawed up burls that we’ve collected, shared food and fellowship, books and ideas, and we've all talked business together. We have finally finished working on these boards, and we would now like to offer them to you. 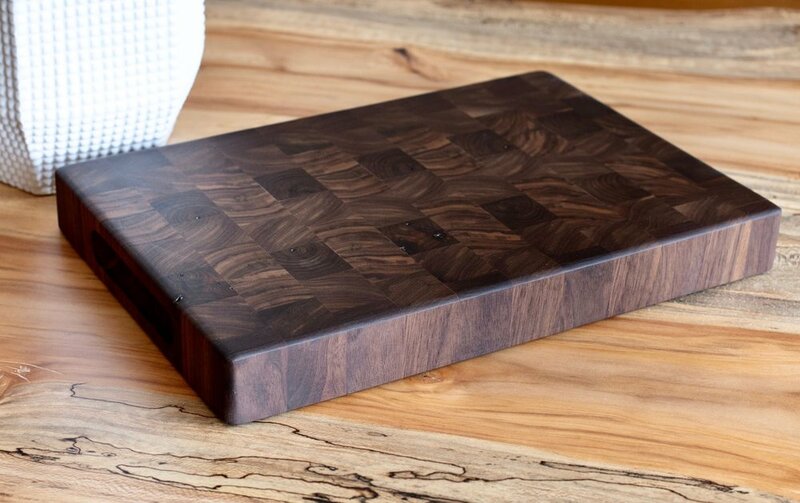 These boards are lovely - black walnut with deep handle notches on the sides for ease of movement and small rubber feet on the bottom to keep them from sliding on slick countertops or from having to put a damp cloth under them. The boards should last a lifetime and are covered by a lifetime guarantee. But why a cutting board, after years of offering nothing but knives? At Bloodroot, we have long discussed how, if we could add anything to our customer’s kitchens, it would be an end-grain cutting board. End-grain wood boards are the absolute best for maintaining knives and significantly increase their edge life. On an end-grain board, the knife edge cuts parallel to the wood fibers rather than perpendicular, which reduces the abrasion on the knife edge and keeps it sharper for longer. So, having an end-grain cutting board helps our knives perform the way they are supposed to. End-grain boards also have other benefits, that we will outline on the page where the board is available for purchase. It has been an amazing year, and writing this has given me an opportunity to think back over it and get excited about next year! Thank you again for making this business possible. We hope that you have a wonderful holiday season with family, and that it makes you feel connected with your communities and hopeful about the new year. Katy and Luke and David and Helen. On a thin wire, a small gray bird flits her tail. Flings her wings to balance. Hops sideways and flies off. A phoebe bird - a fly catcher - she keeps her nest under the eaves of the shed by Bloodroot's shop. Her cry is crackly, and her nest is a mess of moss and twigs perched precariously under a roof. I watch the phoebes flit around the garden, flying back and forth from the fence to the eaves and back, while I work here every day. I'm the very mobile part of Bloodroot Blades. 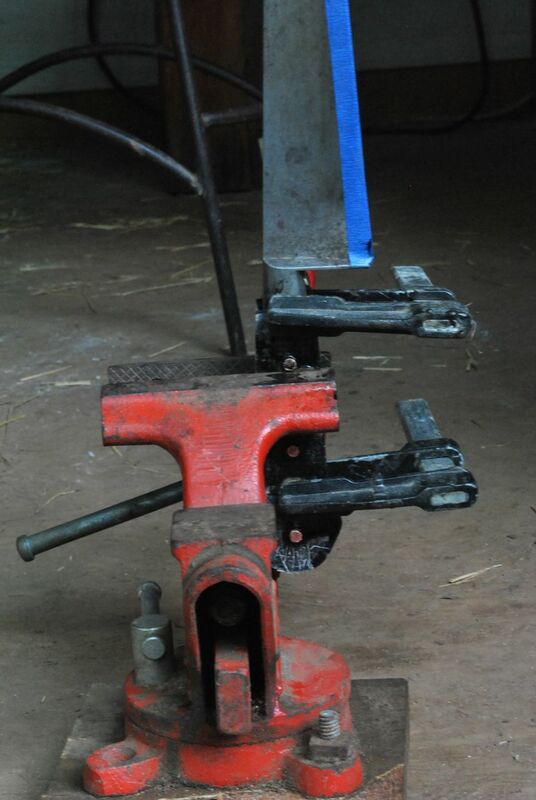 Luke and David have to be behind the anvil, in front of the forge, at the grinder. They have stations. My laptop and I can sit anywhere, and most often, I am outside. Because we're in Georgia, and spring is waning, that won't last long. Soon it will be much too hot to sit outside on this bench and write emails to all of you. But now, it's 70 degrees, and I can sit in the dappled shade, write to you, and watch the phoebes. Behind the garden and the birds is a rising roof. Right now, David and I live fifteen minutes away from the Bloodroot shop, and we drive here each morning. But, when Luke and Helen and David and I bought this land together, the plan was always that we would build a house here and move to the land. That process has begun, and every day, the time gets closer that we will get up in the morning and walk through wet grass to work rather than drive along busy roads. When my vision at the bench gets a little blurry or my mind obsessed with some facet or another, I try to take a walk, heading down familiar trails to see what the woods have to offer in the way of wisdom and provision - perhaps the same thing in the end. What I am typically looking for in the summer and fall are the little orange treasures among the leaves, chanterelles. My immediate object is dinner, and I am thinking to myself in business terms: these mushrooms are tasty, free and relatively easy to spot. I am still striving in a way. Then clarity, and the breath that I had been meaning to take. Our families have thrown in together so that we can make a kind of life, one where we can live a bit smaller and experience a bit more wonder. 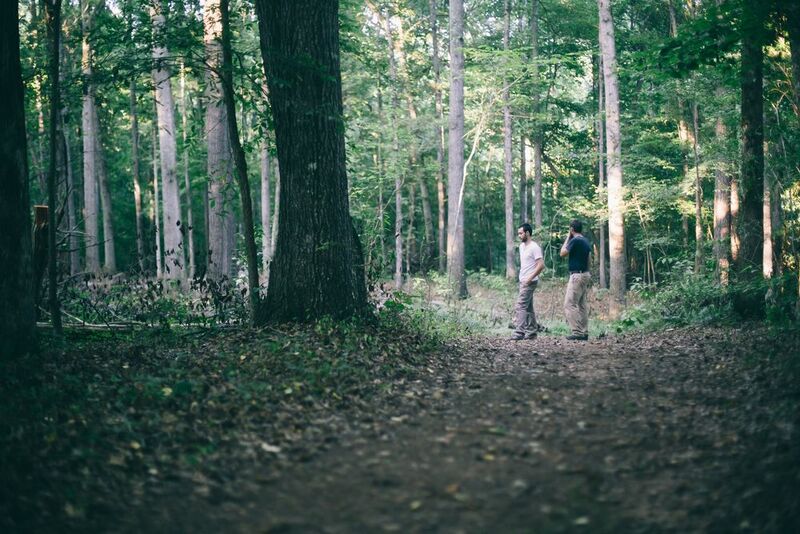 We find ourselves immensely grateful to the community surrounding Bloodroot for making that life a possibility. We have the honor of serving a tremendous group of people, each with his or her own story, and we get to hear parts of that story in the process of designing, making, and sending. Thank you. I walk back to the shop along the creek, grateful for all that the time had to offer and hopeful that tomorrow will bring new conversation and renewed vision. And maybe a few more mushrooms. You may have noticed that for awhile now, our website has had a new look. But, we never mentioned it. At all. In the flurry of activity around here, we (thankfully) finished a redesign and let the new site go live without saying a word. And that's fine, except one of the words we didn't say was a word of thanks. Since Bloodroot became Bloodroot (Four years ago, now? Five? ), there have been more than a few people in the Athens community who have been endlessly encouraging and supportive. Two of those people are John and Paige French. Their friendship to us is invaluable, not just because they've helped us as we have developed our business, but because they are loving, giving human beings whose vision of the world is encouraging to us. They always remind us of the truth, remind us of what we really value, when it's easy to run off course. John designed this website for us, and much of the beautiful lifestyle and process photography comes from the endlessly-talented Paige. Thanks, you two. We admire you so much, and we are very thankful to have you in our lives. You will also find photography on the site by The Grey Ones, two local portrait, documentary, and lifestyle photographers who did some beautiful work for us. Thank you, Jordan and Ben. Now, a word toward what's actually new on this "new" site: we've just recently finished the Process page detailing the steps through which the guys take each knife. We hope this becomes an educational resource, and it definitely becomes a bit technical at time. Luke uses words like "austenite." For those of you who want to go full nerd, have at it. I know we do. David has also finished putting together details on our Legacy pieces, those knives to which customers have supplied their unique materials, making each piece an amalgamation of impossibly beautiful stories. We feel very honored to be able to build these knives. A brief tour of the new space. We have teamed up with our good friend Paige French over the past months and done a couple of projects to document our new shop and surroundings. She and her husband John and their wonderful family have meant a great deal to us and have been some our biggest supporters and cheerleaders. Entering the main doors and looking straight ahead: our two anvils. and the Soderfors with which Luke and his father started their adventures in smithing. On the right, the drill press and doorway to the handling room. Below the shop, we have been in the process of clearing out some of the undergrowth and marveling at the 'hidden' oaks. Two days ago the first of the Bloodroot (Sangiunaria canadensis) poked their buds through the dead leaves next to the shop yet today it is 40 degrees with windblown rain. I like that our namesake is something living, unobtrusive and elegant. For me seeing this come up each spring is a marvel. It is something you see only if you have the eyes to see it. It is so short lived in its showy form that you must be eagerly awaiting it or it will be missed altogether. Since we started Bloodroot Blades seeing this flower always makes me feel like it's a new year, that introspection is in order, and new prospects are in the wings. I am no longer a professional student walking the long path towards a faculty career like I have been for almost a decade. I honestly thank God for it! Having stepped off that path last year has had its bittersweet moments. A few weeks ago I could have met with one of David and my heros and favorite author, Wendell Berry, near his home in Kentucky. It was with a group of people I have been long connected with and greatly respect, but I now do not qualify as one of them and could not participate. I am no longer a future colleague to those who long thought I was, but instead I am one who "left the path"- a statistic for department heads. However, instead of studying sustainability I am now more than ever living it and being challenged by it. How is living and working with intentionality less of an educational process than pedagogy? It is an interesting practice to desire and choose ways of doing business that support our principles, yet feel the pull and need to make a living and run a business with accumen and intelligence. In the day to day work and intesive time spent on email, phone, and with customers there is little opportunity for introspection. I am happy that David and I had some time to establish ourselves with one another and build a foundation that could handle the pressures of a 19+ month waiting list. We love building knives and working with people of many walks of life. We love working together, we love our families, and we love doing life other than work. We have both chosen this life, this opportunity, and are here, God willing, to stay. Thank you all for making this a possiblity. I had a moment yesterday in the shop where I realized an irony of a owning a 'hand-made' business: I use the i-pad on the right as much or more than the file in the back. It is interesting to consider that something we consider 'virtual' is so very real in our practice. 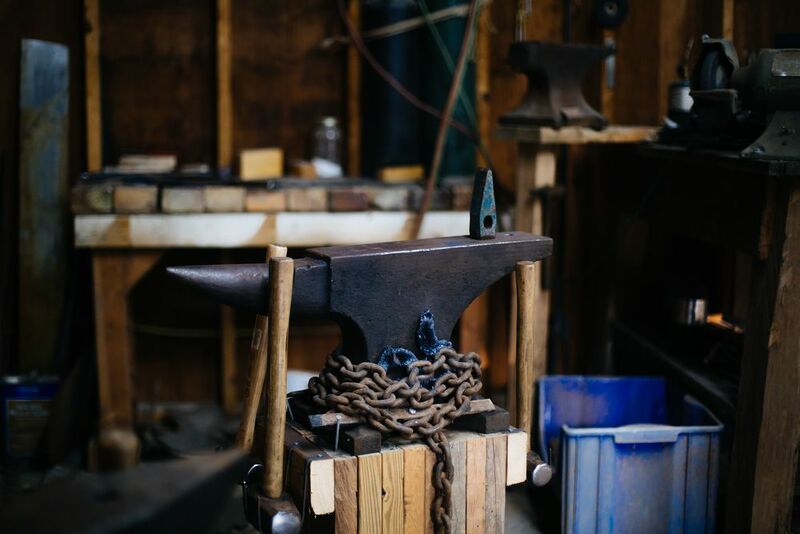 Yes, we have to be good with hammers, grinders, files, and, oddly, dental instruments (center back), but we also must be good with the tools of community and information. We recently entered a contest of American-made crafts in Martha Stewart Living and would be thankful for your help in voting and putting the word out. Online voting closes in mid-September. Luke and I spent some quality time putting together our thoughts in what ended up a brief package, and we would love to hear your feedback. Over the last several years, David and I have come to understand that each hand is unique and that a knife may be loved by one and disliked by another. It's one of the main reasons that we build knives to the person for the most part. After the fitting, David and I were both thinking the same thing: we like working out of a paradigm that views a hand with a titanium support like every other hand--instead of a cause for increased prices or special treatment. Ours is not the industrial model which homogenizes, but a model that delights in complexity and diversity. Being a small part in this family's story is a privilege for us. My neighbor, Matthew, from Big City Bread, brought us set of beautiful old Sabatiers for restoration. 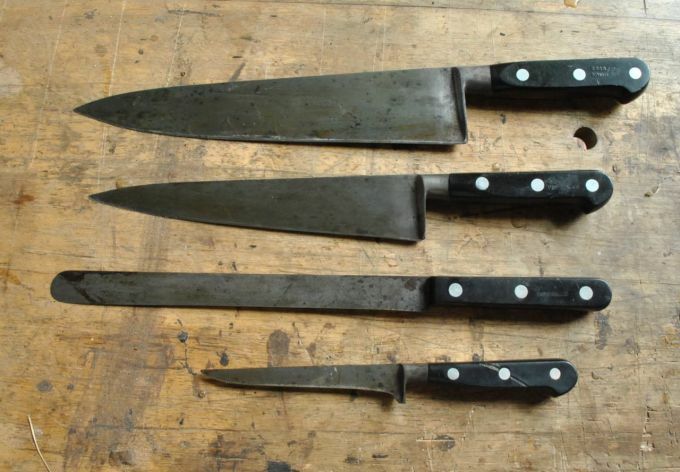 They were storied family knives, belonging to his grandmother, father and Matthew himself when he was in culinary school in New York. One was that they needed rehandling. 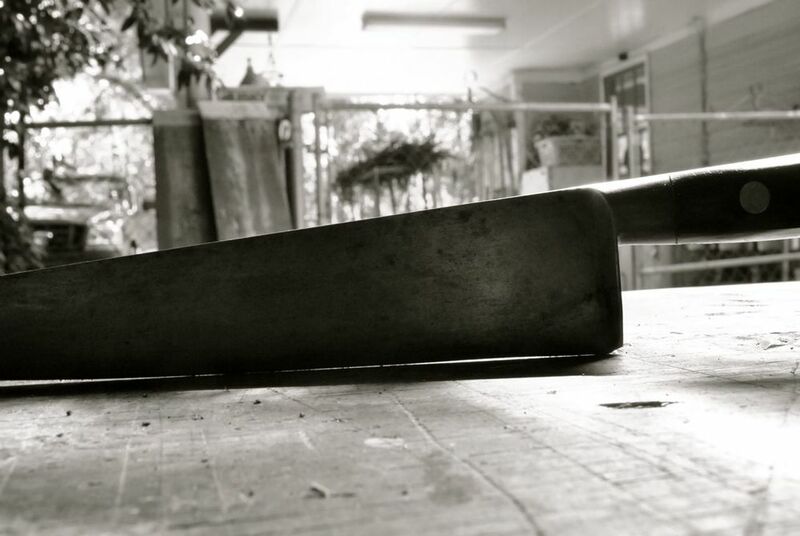 Sabs are riveted but not glued so there is a build up between the scales and the tang that develops over time. Also, rehandling would improve the balance of the two larger knives because the original plastic handles are a bit light and shift the fulcrum point out into the blade a bit. The other was a reprofiling for the two chefs. They had been steeled so much over the years that the profile needed to be flattened out to make full contact with the cutting board. Then came the glue up. After a bit of grinding and finishing on the handles, as well as a grinding, reprofiling and sharpening the blades, they were again ready for full use. A new, old set of knives. Thank you, Matthew, for trusting us with this project. It was a pleasure.